This book was kind of like a ho-hum day at the office. You roll in, settle into the routine, you’re not really excited to leave or but not exactly be there—just kind of ‘meh’ as you go about the motions. Basically I’m trying to say it wasn’t terrible, but it wasn’t outstanding, either. I started it. Read it. Was vaguely startled when I got to the last page in a very anticlimactic fashion. 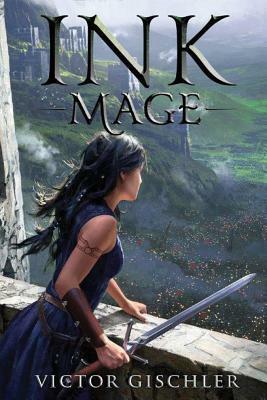 There were some things I really appreciated about this book—the worldbuilding and magic, for example. Magicians have magic infused in their tattoos—each tattoo (which is tattooed on them by a priest or a priestess or a wizard who have learned how) has meaning. For example, Rina, the ink mage dutchess main character, gets wings tattooed on her ankles using embers from a tree struck by lighting. This tattoo makes her wicked fast. She also has a bull inked on her shoulder, which makes her super strong. Etc. The magicians tap into their spirit for strength to use their magic, so they don’t have an endless pool of badassery. Just a little. The worldbuilding was also good, and it clearly laid out the opposing kingdoms and their differences. The characters were so-so. I found love-struck Alem, revenge-obsessed Rina, greedy Bransley and pansy Tosh pretty irritating to follow for most of the book. I gave this book a 3/5 on Goodreads—it was okay, but I probably won’t be singing it’s praises from the rooftops.